If you are looking for some heat this summer the hottest place in Ireland will be O’Donnellan & Joyce’s property auction on July 24 in the Harbour Hotel. “We have incredible diversity and value in this summer auction sale with over 50 properties, a substantial amount of them throughout Galway city, comprising several houses in desirable locations such as Devon Park, Merlin Park, Newcastle, Tirellan Heights, and a large variety of city centre apartments," said Galway auctioneer Colm O’Donnellan. "There are a number in the Salthill area with panoramic views of Galway Bay and the surrounding coastline." If you are looking for property in Galway city you will not want to miss this auction. This is the best selection of properties in Galway going under the auction hammer and must be sold. The auction on July 24 will have incredible value, diversity, and some exceptional properties which will create excellent interest which is anticipated from both home and abroad. Here is a selection of some of the properties going under the auction hammer in the Galway area. No 10A Newcastle Road, Galway: A very attractive five bedroom detached house in first class decorative order and condition. Offering over 1,100sq ft of spacious well laid out modern accommodation with enclosed patio yard to rear, this house is being sold fully furnished. Open viewing Wednesday and Saturday from 3.30pm to 4.30pm. AMV is €220,000. No 4 Presentation Road, Galway: This distinctive four bedroom city centre property is magnificently refurbished to a very high standard and oozing with style and class. The property has a modern interior while maintaining its old world charm. Open viewing Thursdays and Saturdays from 2pm to 3pm. AMV is €300,000. No 86 An Creagan, Barna: A four bedroom end of terrace residence located in a well maintained estate. No 86 has a southeast facing garden and would be an ideal family home or gilt edged investment property. Open viewing Wednesdays and Saturdays from 11am to 12 noon. AMV is €260,000. No 3 Gort Na Bro, Western Distributor Road: This three bedroom semidetached residence is located to the front of Millar’s Lane on the Western Distributor Road. It has a northeast facing rear garden with large shed. Open viewing Wednesdays and Saturdays 2pm to 3pm. AMV is €190,000. No 83 Devon Park, Salthill: This superb five bedroom semidetached residence is located within a stone’s throw of Salthill. Situated in a highly sought after residential area, this property has space in abundance and a large garden with self contained apartment. Open viewing Thursdays and Saturdays 11am to 12 noon. AMV is €475,000. No 17 Whitestrand Park, Salthill: This is a beautiful five bed semidetached property in turnkey condition. There is off street parking to the front and a patio to the rear. No 17 is conveniently located within close proximity of the city centre, Salthill Promenade, The Claddagh, and Spanish Parade. Open viewing Thursdays and Saturdays 12.30pm to 1.30pm. AMV is €350,000. 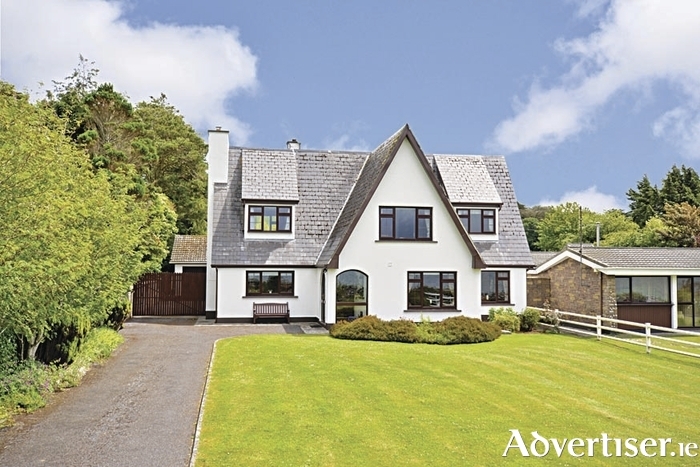 No 293 Tirellan Heights, Headford Road: This four bedroom semidetached residence is located on the Headford Road within walking distance of Terryland Shopping Centre, schools, and church. It is in need of some modernisation. There is off street parking to the front and a good sized garden to the rear. Open viewing Thursdays and Saturdays 12.30pm to 1.30pm. AMV is €170,000. No 20 Inchagoill Road, Newcastle (executor sale ): This five bedroom detached residence is within close proximity of NUIG and UHG. It has oil fired central heating and a large east facing rear garden. Open viewing Wednesdays and Saturdays 5pm to 6pm. AMV is €295,000. No 1 Holly Grove, Renmore: This is a beautifully located three bed semidetached property in first class condition situated on large corner site. This modern family home is not overlooked and boasts exceptional views over Galway Bay. Open viewing Thursdays and Saturdays 5pm to 6pm. AMV is €235,000. No 11 Woodhaven, Merlin Park: This superbly located seven bedroom detached residence with three en suites is in need of extensive refurbishment. There is parking to the front for four cars and large rear yard and side entrance. Open viewing Thursdays and Saturdays 6.30pm to 7.30pm. AMV is €360,000. No 78 Glen Dara, Bishop O’Donnell Road: This fine four bedroom semidetached property is within close proximity of NUIG and UHG. The rear garden is not overlooked. No 78 is being sold fully furnished. Open viewing Thursdays and Saturdays 3.30pm to 4.30pm. AMV is €150,000. No 59 River Grove, Oranmore: A delightful three bedroom semidetached residence located in a popular residential development, No 59 extends to circa 1,000sq ft and is presented in excellent condition. This is an ideal starter home or gilt edged residential investment. Open viewing Thursdays and Saturdays 11am to 12 noon. AMV is €120,000. No 6 Oakfort House, Oaklands, Salthill: This lovely and bright two bed apartment is located on the second floor in a small complex in the quiet residential area of Oaklands. The property is only a two minute walk to Salthill and comes with one car parking space. Open viewing Thursdays and Saturdays 5pm to 6pm. AMV is €145,000. No 17 Clan House, Dominick Street: This city centre apartment is located in the heart of Galway’s West End with easy access to many shops, cafés, and restaurants. Dominick Street is a short stroll from NUIG, UHG, and Shop Street. Open viewing Thursdays and Saturdays 12.45pm to 1.30pm. AMV is €100,000. No 19 Lisdonagh Apts, Cuan Glas, Bishop O’Donnell Road: Lisdonagh is a modern apartment complex situated on Bishop O'Donnell Road about 18 minutes’ walk from NUIG and UHG, with two major bus routes passing close by its doorstep. This is an ideal investment opportunity. Open viewing Thursdays and Saturdays 2pm to 3pm. AMV is €80,000. No 19 Mullan Mor, Tuam Road: This fine three bed duplex apartment is in an excellent location close to all major industrial estates. The master bedroom is en suite and accommodation extends to circa 1,200sq ft. Open viewing Thursdays and Saturdays 2pm to 3pm. AMV is €130,000. Rusheens South, Corofin: This attractive two storey farmhouse is on a circa 0.5 acre site overlooking the countryside. The property is located at the end of a quiet cul-de-sac, approximately one mile off the N17 main Galway - Tuam road. Open viewing Wednesdays and Saturdays 2pm to 3pm. AMV is €85,000. Ballyglass, Turloughmore: This superb four bed bungalow style property in the village of Turloughmore is only a 10 minute drive from Claregalway and five minutes from Lackagh. Standing on a site of circa 0.75 acre, this ideal family home has recently been refurbished and modernised. Open viewing Wednesdays and Saturdays 3.30pm to 4.30pm. AMV is €195,000. Lake Road, Loughrea: This magnificent imposing residence offers breathtaking views over Lough Rea. The house is surrounded by manicured gardens with magnificent views from all rooms. It is within a leisurely stroll of the centre of Loughrea town and within easy access of Galway city. Open viewing Thurdays and Saturdays 5pm to 6pm. AMV is €250,000. Raheen, Kilchreest, Loughrea: This four bedroom detached residence is on a 0.33 acre site. The attic is converted for storage. The property is located on the main Loughrea to Gort road. Open viewing Thursdays and Saturdays 3.30pm to 4.30pm. AMV is €150,000. Salmon Leap, Shrahalia, Cashel, Connemara: This wonderful four bedroom family home in Cashel, Connemara, is on an elevated site of approximately one acre with stunning views of Cloonisle Bay. This is an ideal permanent residence or a holiday home close to Roundstone and Ballynahinch Castle. Open viewing Sundays 12.30pm to 1.30pm. AMV is €150,000. Land at Drum, Oranswell, Galway: This is a parcel of land of approximately 33 acres with a derelict house, located on the Oranswell road close to the Salthill Devon complex. The land is currently not zoned but has immense potential for future development. AMV is €300,000. Curraghgrean, Coast Road, Oranmore: This small bungalow on large site overlooking Galway Bay comes with full planning permission until 2019 in one of Galway's most desirable locations. There is no local housing need or inurement clause on the site. This is a rare opportunity to build your own home in a vibrant area within easy access of both Galway city and the M6 motorway, and situated close to Oranmore's new railway station. AMV is €200,000. Also going for auction on the day are properties in the city centre, Barna, Salthill, Western Distributor Road, Monivea, Connemara, Tuam, Mayo, and Roscommon. For further details and open viewing times see www.odonnjoyce.com for full brochure and pictures of each property, or contact the O’Donnellan & Joyce auction team on 091 564212. Page generated in 0.1369 seconds.